I love drawing but always feel as though I should take up painting or go back to screen printing or something to bring my work to life and give it colour and depth. The only problem is I think I’m a bit too lazy to get the paints out and I don’t really have a space dedicated to messy screen printing equipment just yet; as much as I love the effects it can produce. I’m, much more likely to have a play with my drawings in PhotoShop which is fine, but sometimes it feels a bit like cheating to me. 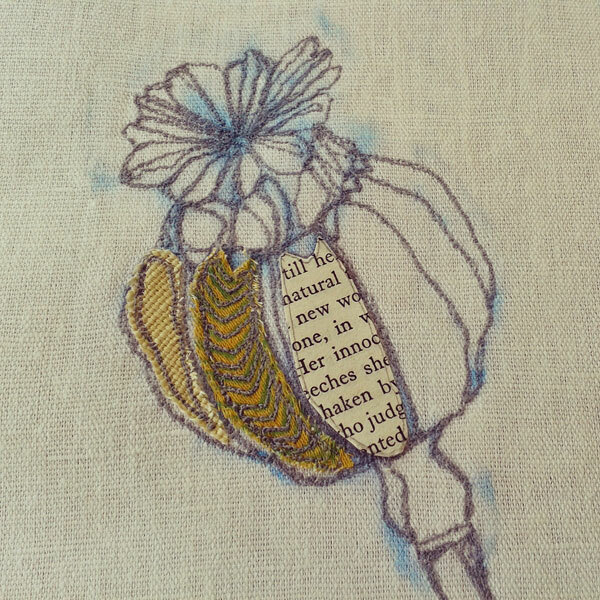 Anyway, I haven’t been completely lazy and have been really enjoying working on my drawings with lots of machine embroidery lately which is great fun. I was inspired to get my sewing machine out of it’s cover when I visited the Affordable Art Fair at Battersea earlier this year. When I walked into the show the first thing I saw was an artist sitting at a sewing machine and I had to go and have a look. 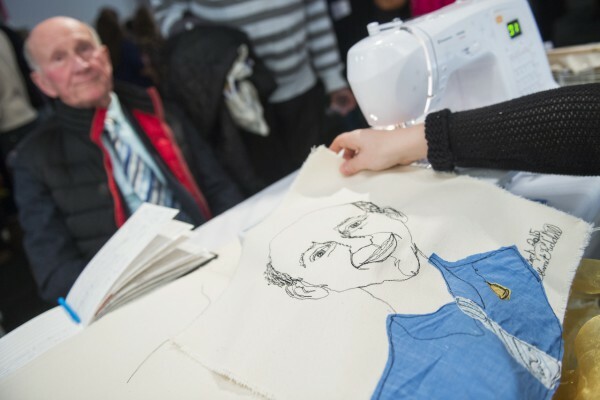 Harriett Riddell was artist in residence for the evening and was surrounded by ‘spectators’, avidly watching as she casually machine embroidered portraits for just £40 each in half an hour. I loved her quirky free style and couldn’t believe that she did it all without drawing anything first! I’m not quite so brave… yet. 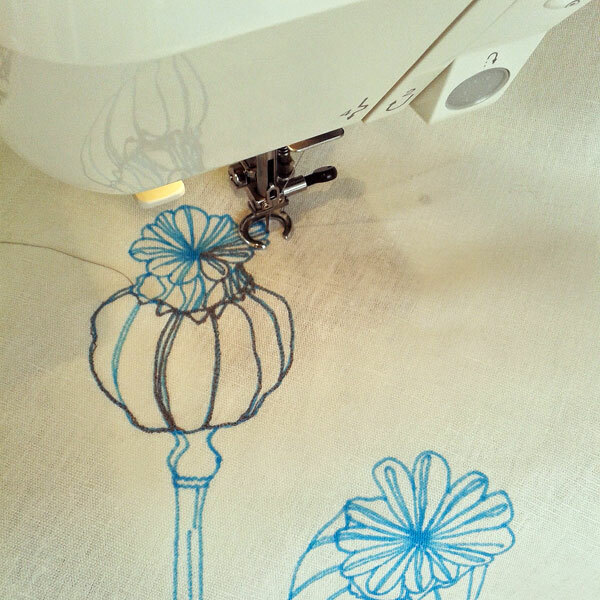 I like to draw on paper first, then, if it’s a drawing I really like and I think it would look good on fabric I prepare for machine embroidery by tracing the drawing onto some fabric using a washable pen. I starch the fabric first – this makes it easier to sew using a sewing machine and means you don’t need to use an embroidery hoop which can be a bit cumbersome. You need a special foot for machine embroidery – see the photo below – it has a kind of ring foot so that you can see where you’re sewing. It’s also vital before starting to lower the sewing machine teeth – this means that you can move the fabric freely, rather than sewing in straight lines. Set the sewing machine to a normal stitch and don’t go too slow. Just practice on a scrap of fabric first; try writing, it’s very liberating once you relax and un-hunch your shoulders!! 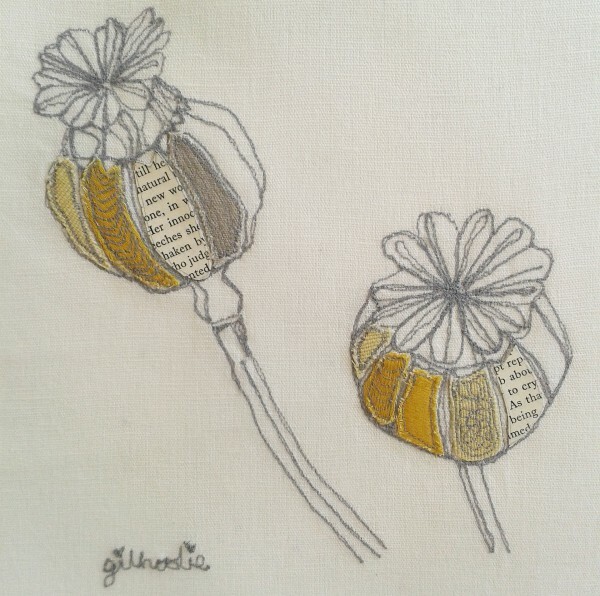 Here’s a picture I took when I was working on my first machine embroidery flower picture – dried poppy seed heads. The blue lines are from the washable pen and have to be washed out after sewing. I like the way machine embroidery gives the drawings a sketchy feel and I’m getting better at accepting the fact that they can’t be perfect (and it’s actually best that they aren’t!) I’m on my third flower drawing now and I have become much better at drawing the outline first but then filling in a lot of the detail as I go; using the needle as if it were a pencil. Once I have stitched the outline of the drawing I get out my stash of fabrics and choose 2 or 3 I think would work to add some colour and pattern. I attach the fabric by ironing on Bondaweb – all a bit fiddly but it stops it moving around and means you don’t have any messy glue or sharp pins in the way. Then you can get sewing again. It’s definitely not something to do if you’re in a rush or not feeling very patient! And here’s the final piece. I think it’s my favourite one so far and that’s because it’s very simple and I really like the colours (grey and yellow always a favourite) and shapes of the flowers. Watch out for more on the other drawings in future blog posts. For now though, my latest project is to cover some foam on a window seat in our new dining room, hopefully edged with contrasting binding (arghhh!) A bit of a challenge as I haven’t made cushions for a long time; I think I’ll have to watch that video on inserting a zip again first! !